The Irish Rep’s production of The Emperor Jones is an expressionistic masterpiece. Under the boldly inventive eye of director Ciaran O’Reilly, Eugene O’Neill’s controversial 1920 play thumps and swirls itself deeper and deeper and with increasing wonder into the fissured psyche of its title character. There O’Neill and O’Reilly find chilling terrors that this production succeeds in conjuring to vivid life in such a way the envelopes the entirety of stage, audience, and space. The show is 75 minutes of intense, gripping excellence. 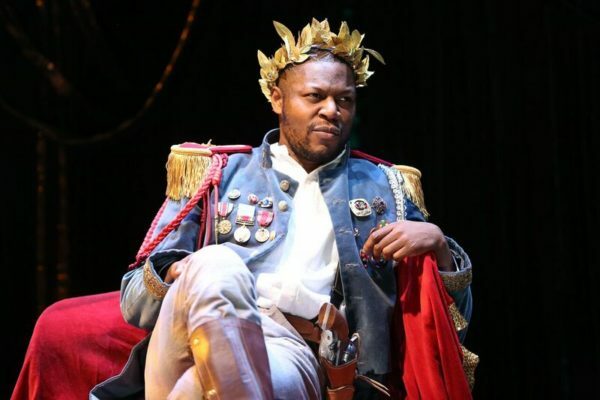 The last time O’Reilly mounted The Emperor Jones, in an acclaimed 2009 production that this show revives, he had the great talent of John Douglas Thompson as his lead, and here too the production benefits from a powerful central figure: the London-based actor, Obi Abili. O’Neill asks much of his Brutus Jones: not only does he dominate stage time, but he also must unfold his mind before the audience, showing how suppressed fears that have refused to dissipate overtake him bodily as much as psychologically. Abili negotiates these demands with great aplomb, skillfully presenting a torn and deeply fraught Emperor who struggles constantly for control over his body, his fate, and his tortured mind. The play chronicles the last hours of its eponymous emperor, an African-American man who, after having fled the country with two murder charges dogging at his heels, established himself as a demagogue over jungle natives. As the play opens, however, his subjects’ patience has run out, as Jones always knew it would, and so with the money he stole stashed securely in foreign banks, he sets out on his escape route through the jungle. But the steady, ever-louder pounding of a drum will not let him forget that his pursuers gain on him, as the jungle’s depths dismantle his psyche. The play is frequently and not without justification deemed racist, as O’Neill gives the emperor a black vernacular patois that approaches minstrelsy and the jungle denizens are grounded firmly in paternalistic primitivist stereotypes. But here Abili is too powerful and vibrant to allow his character to exist only as type. Not only does the actor deliver Jones’s lines with an assertiveness that overpowers O’Neill’s racism, but he also fills Jones with a life force that overcomes any suggestion of simplicity. In the hands of Abili and O’Reilly, this emperor becomes a dynamic, complex, if nonetheless deeply flawed, human. Even with stellar acting and directing, the elements that lift this production to its greatest heights come from its technical team. Sets (Charlie Corcoran), lighting (Brian Nason), sound and music (Ryan Rumery, M. Florian Staab, and Christian Frederickson) all combine on the Irish Rep’s tiny stage to evoke a mystical, spooky, and seemingly limitless jungle, while props (Dierdre Brennan) and wonderfully inventive costumes (Antonia Ford-Roberts and Whitney Locher) breath real depth and texture into the proceedings. Puppets and masks (Bob Flanagan) work evocatively to destabilize any sense of reality in Jones’s world, while Barry McNabb’s choreography, and indeed all the play’s movement suggests the spiritual power of ritual at work. The five-person ensemble interacts skillfully with these technical elements to ensure that the show bursts at all times to life. Attempts can certainly be made to make The Emperor Jones realist and perhaps more accessible, but O’Reilly rejects any such idea in favor of forging deeper and deeper into an expressionist jungle of psychological mystery. The expedition pays off handsomely, as this production captures all that makes O’Neill’s early play powerful and haunting.